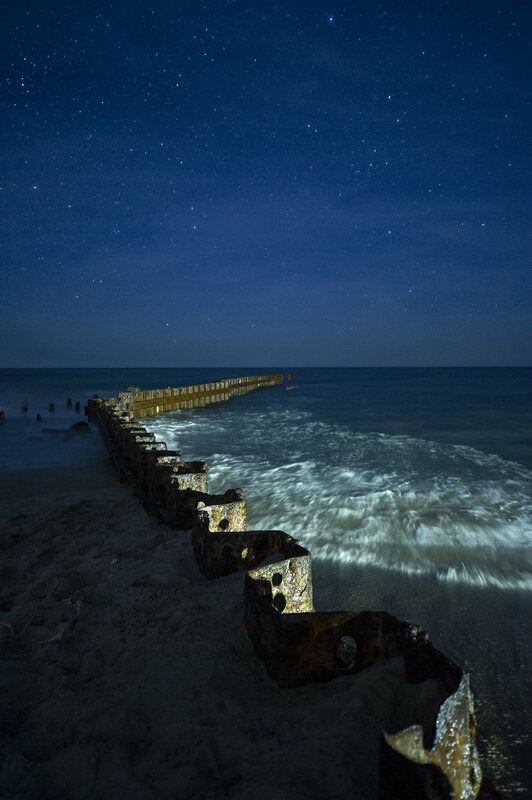 Journey to the Outer Banks and Cape Hatteras National Seashore, where the waves roll from the horizon to meet the dunes of North Carolina. 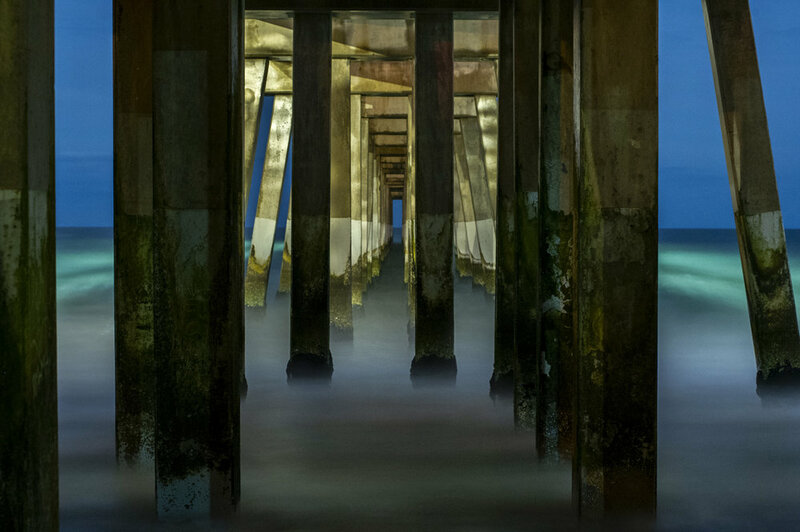 The Outer Banks—what a name, and what a place! 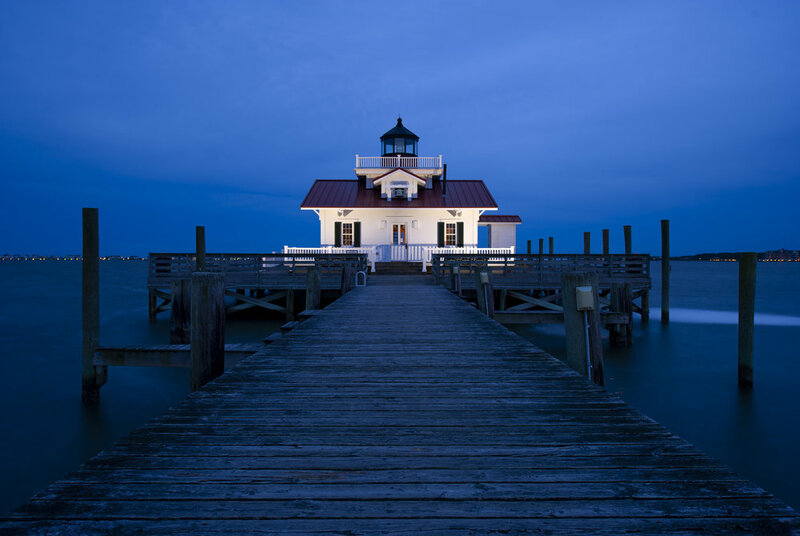 Home to tasty crab cakes, the honored ground of first flight, pristine national seashore and perhaps the most iconic lighthouse in the United States. And at night, when you look up, oh my! You take in the stars and the Milky Way in that incredible Atlantic darkness while the ocean breezes tousle your hair and bring salt to your lips. And beneath it all, a camera and a tripod, capturing the majesty of what this special place offers. This is a 5-night, 6-day workshop. Your adventure begins at 10 a.m. on May 19 and ends after a final slideshow on the afternoon of May 24. $1,750 + applicable taxes. Register below. Open to all who have an understanding of the basic principles of photography and of their cameras. HOPING TO GET A SPOT? Sign up Below for our no-fee WAITLIST. Deposit of $500 is required to reserve your spot at the workshop. Balance of $1,250 due on February 18, 2019. You may choose the “Pay in Full” ticket if you desire to pay all at once. Last day for a cancellation request is February 17 (see cancellation and refund policy). The workshop fee does not include transportation to and from the park, lodging, food or the park admission fee. 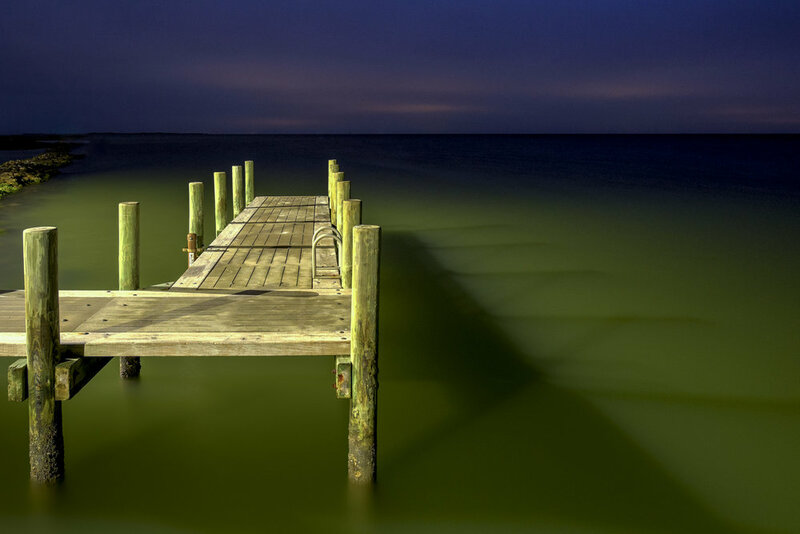 The Outer Banks is a long, long strip of land in the Atlantic Ocean. 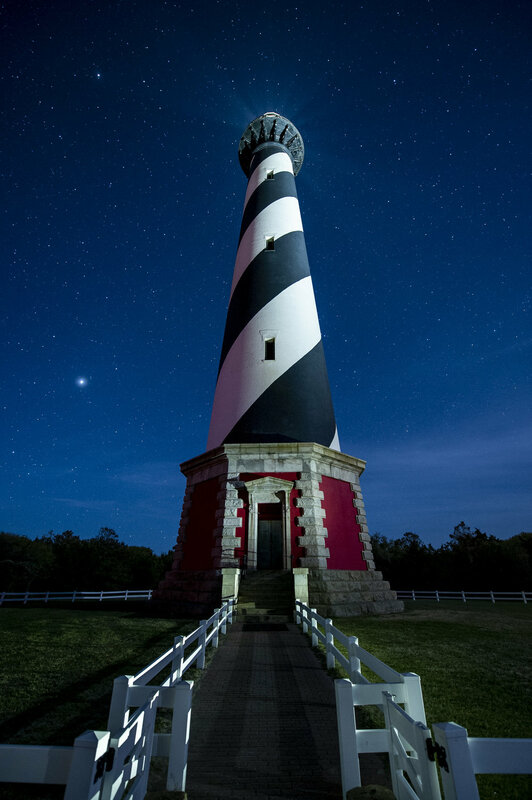 To make the most of this destination and photographic heaven, we will split the workshop between two different towns—Kitty Hawk and Hatteras—to give us the easiest access to our subjects. Each day we will either learn in the classroom or make a side jaunt to see and learn more about the area. Then each night, we will photograph! Our shoots will span the Outer Banks from the touristy areas of the north to the quieter confines of the lower islands, including a ferry ride and day/evening trip to Ocracoke. 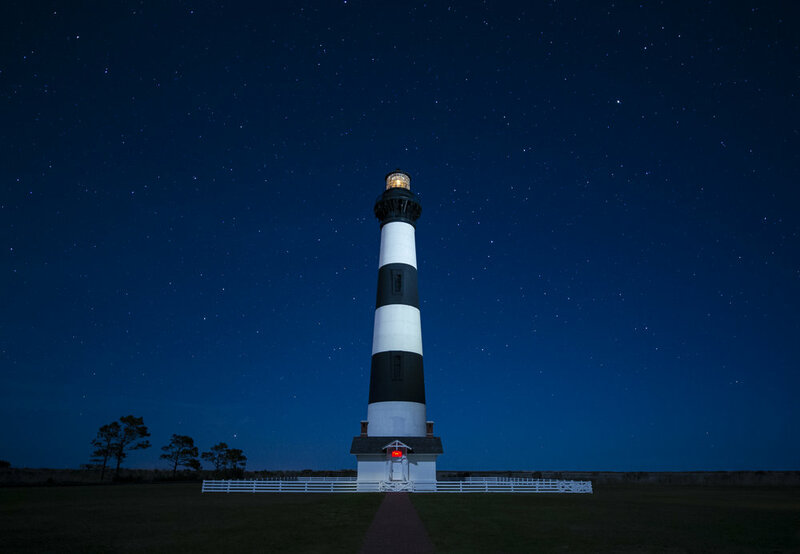 One of the photographic highlights of the Outer Banks is its collection of charming lighthouses, including perhaps the most iconic in the country: Cape Hatteras Light. We will photograph nearly all (if not all) of the mainland lighthouses. We will also explore the sand dunes, the shores, the swimming beaches, the long piers and more. 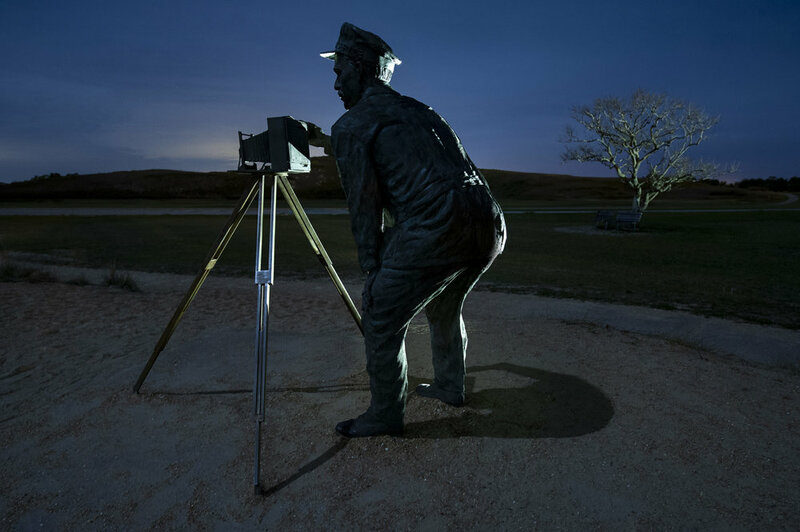 And we will photograph one of the most famous sites in aviation history: the Wright Brothers National Memorial, where the human race first took to the skies. Participants must have at least basic photo skills, know their cameras well, and be comfortable shooting RAW in manual mode with a DSLR or high-end mirrorless camera. Intermediate or higher experience is best because we won’t have as much class time as usual, but as long as you meet the prerequisites just mentioned, we’ll make sure to catch you up on the rest. 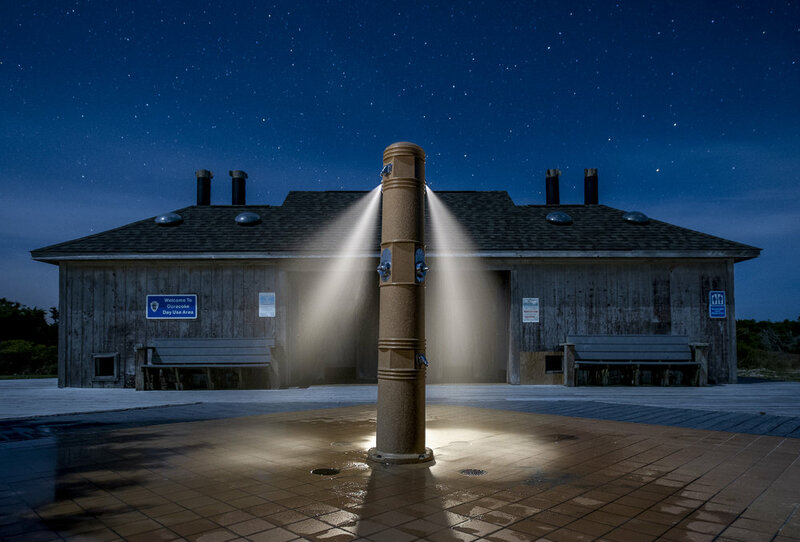 Night photography experience is not necessary, but even folks with extensive experience shooting at night will find this class challenging, stimulating and inspiring. 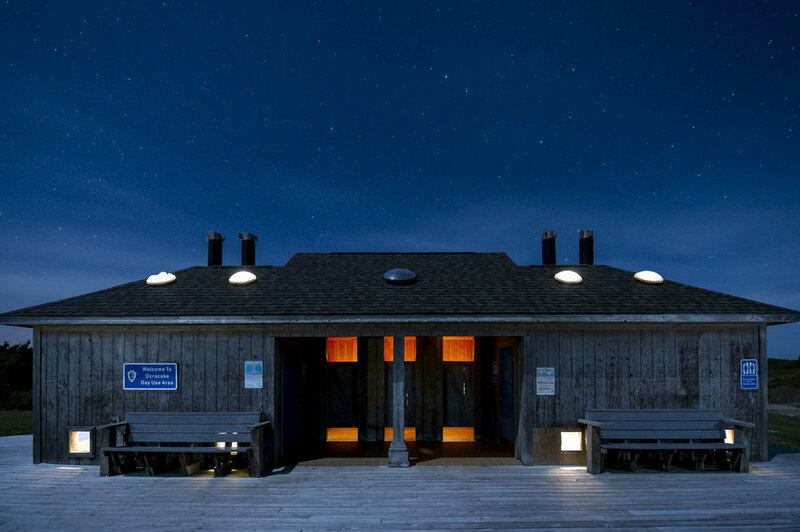 For more advanced night photographers, we can offer a portfolio review, specific challenges and goals, and will offer guidance in the field if you mainly want to concentrate on creating portfolio images or learning more advanced techniques. If you would like to attend this workshop but are unsure whether you have adequate night photography skills, we can offer pre-workshop tutoring to get you ready for your adventure with us. Alternatively or additionally, a few of us have written books that may be productive pre-workshop reads. This workshop will have both field and classroom instruction. 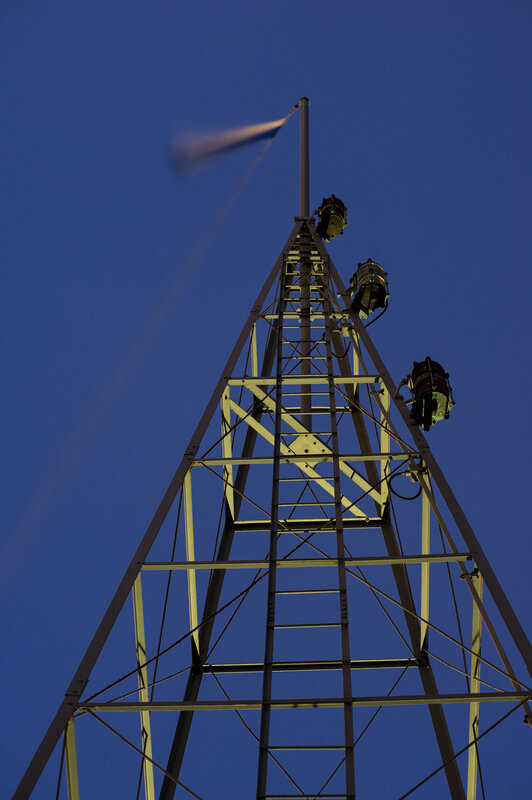 We will be in the classroom each day, and out in the field at different locations each night. Participants can stay out shooting as long as they, or their camera’s batteries, hold out. While in the field, the instructors will demonstrate their own techniques and will work with participants one-on-one to make sure everyone gets the most out of the workshop. During classroom sessions there will be presentations by the instructors, but we will focus on developing your images and sharing everyone’s work and ideas with each other. Each day will have a review of the previous night’s work. The Outer Banks is relatively easy to get to, though it does require a bit of time in the car (unless you fly into a private plane to one of the two small airfields on the islands). If you are interested in carpooling or sharing a rental car, let us know and we will try to connect you with another student looking for the same. You are responsible for arranging and paying for your own transportation. We will be staying in Kitty Hawk for half of the workshop, and in Hatteras for half. You are not required to stay at the official workshop lodging, though doing so does make it easier to meet with the group each morning. Lodging info and group code will be sent after registering. If you are interested in sharing lodging, let us know and we will try to connect you with someone like-minded in the group. The Outer Banks has plenty of good food options, both chain and mom-and-pop (the latter being our favorite). We encourage eating two meals per day—a good breakfast and a great late lunch. When on the night shoots, you may wish to bring snack food or a sandwich and plenty of water. You are responsible for arranging and paying for your own meals and accommodations. Spring in the Outer Banks is—well, spectacular. On sunny days we can expect daytime temperatures in the 60s and 70s, and nighttimes that are comfortably cool. Recommended attire: Jeans or medium-weight pants, short-sleeve T-shirts for day, long-sleeve T’s and sweatshirts for night use, and a medium-weight jacket. Waterproof hiking shoes are a good idea, as we’ll be working around water. Also bring rain gear; we will shoot if it rains, because … well, it’s amazing. No vigorous activity will be required during the workshop, but please consider your physical abilities prior to registering. There won’t be any long hikes, but you should be comfortable carrying your own equipment over sand and uneven ground in the dark. Please read our FAQs section for more information about skill and gear requirements, and other information that pertains to all our workshops. If you have questions, please contact us—we're happy to talk it over with you. The Outer Banks is a magical place. I visited there with a girlfriend in my late 20s. I loved the surrounds and the feeling they inspire. For 15 years I knew I wanted to return alone for photography, an opportunity that became easier to come by when I moved to North Carolina a few years ago. I made a springtime visit to the area, arriving just as twilight was falling over the seascape. My first stop? Bodie Island Lighthouse. In my younger photography days I became enchanted with photographing lighthouses, an itch that still grabs me whenever I see that one is nearby—especially at night! 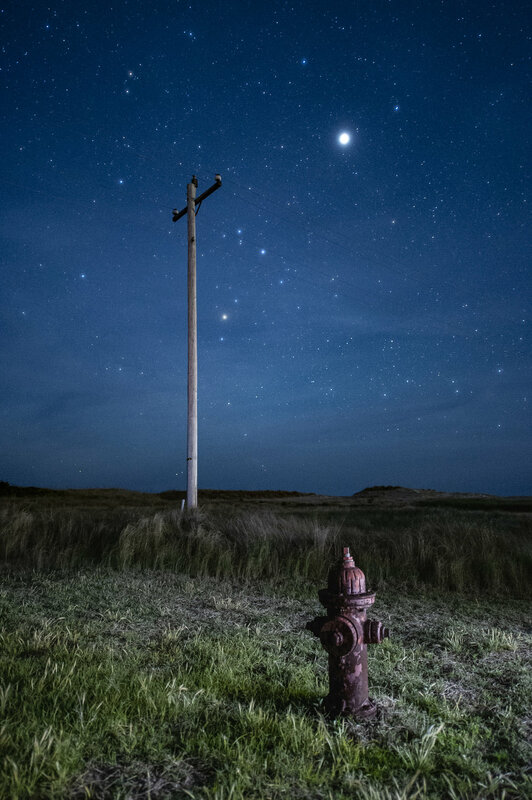 I photographed at Bodie Island, then moved down to Cape Hatteras Light, which every American knows by sight, even if they don’t know its name or that it hails from these shores. Photographing both in the same moonlit-kissed, starry night was an almost mystical experience. You can’t stand at the bottom of these monuments to maritime, watching their lights stretch to far-off horizons, without wondering about all the decades they have stood while saving and protecting lives at sea. 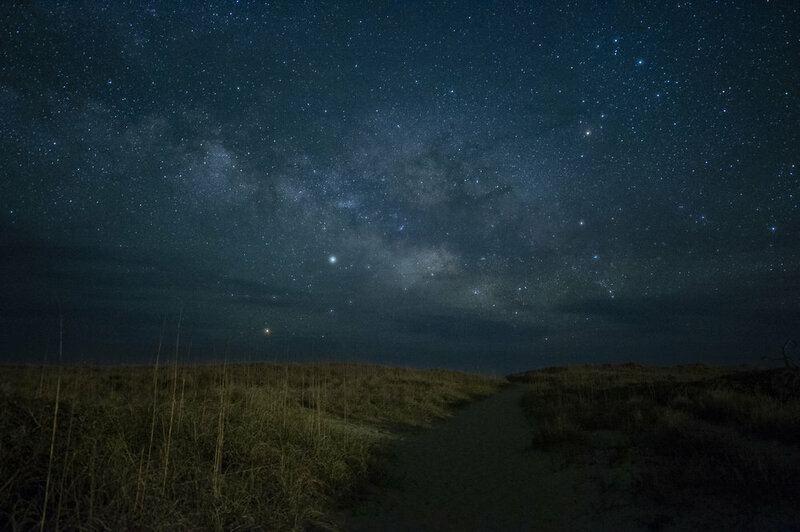 Nights in the Outer Banks are magical, particularly when you stand by the ocean, watching waves roll in from distant shores, hearing them rush onto the sand and toward your feet. The stars shine, the wind whispers. I’m always looking forward to returning once again.